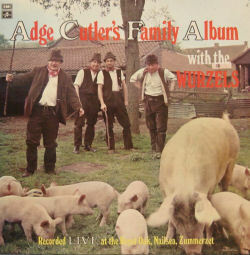 Adge Cutler & The Wurzels' second album was, like the first, recorded in front of a live audience in the upstairs room of the Royal Oak pub in Nailsea, North Somerset. 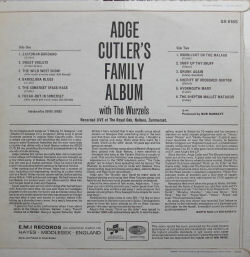 The album some of Adge's best loved songs - most notably The Shepton Mallet Matador, Easton-In-Gordano and The Somerset Space Race. 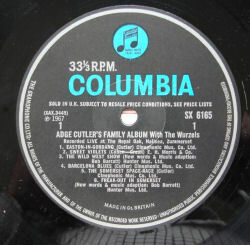 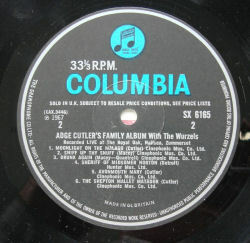 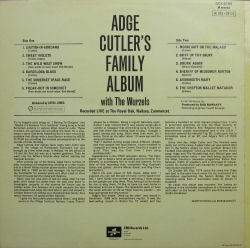 But unlike the band's debut (which were all Adge's songs), Adge Cutler's Family Album contained a few non-Adge songs and included two songs tracks penned by other band members (Sniff Up Thy Snuff and Drunk Again), as well as two adaptations by producer Bob Barrett. 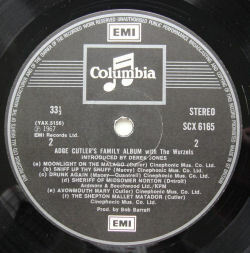 Wurzelphonist Brian Walker had by this time left the band, leaving the band as a four-piece. Band line-up: Adge Cutler (vocals), Reg Quantrill (banjo and guitar), Reg Chant (accordion) and John Macey (bass). 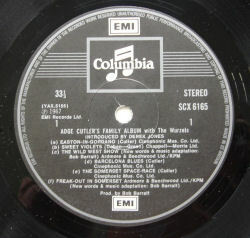 No single taken directly from the album, but the single I Wish I Was Back On The Farm was released the same year and had Easton-In-Gordano (taken from the album) as the b-side.